To Make Crust: In a medium bowl combine graham cracker crumbs, ground pecans, white sugar, and 1/8 teaspoon ground ginger. Mix well, then pour in melted butter. Stir until butter is evenly distributed. Press mixture into a 9-inch pie plate. Set aside. To Make Filling: In a large mixing bowl combine cream cheese and brown sugar. Beat until smooth, then add eggs, pumpkin, and cream. Mix well. Stir in cinnamon, ginger, nutmeg, cloves, and salt. Pour mixture into pie shell. Bake in preheated oven for 35 to 40 minutes, until set in center. Chill before serving. Garnish with whipped cream and pecan halves if desired. 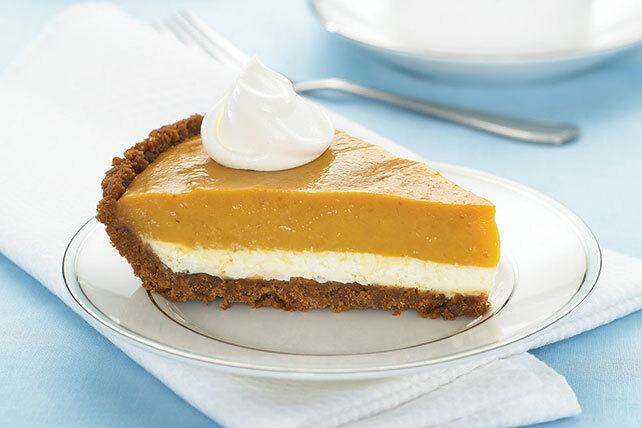 No comments for: "Pumpkin Cheesecake Pie Recipe"